Power Steering Kit. Complete tech article show you how! In last month's issue of Custom Classic Trucks, we showed you the first half of dropping a '55-59 GM pickup ("Drop, Stop and Go!" Apr. '06) using parts from Classic Performance Products (CPP). In this issue we follow along as one of CPP's '55-59 GM pickup Rear Leaf Spring Conversion Kits is installed in a '56 Chevy half-ton pickup. 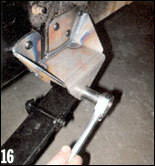 The kit lowers your pickup's rear 3 to 4 inches by placing the rearend on top of the leaf springs. Just moving the rearend to the top of your original springs will actually place it too close to the rear rails and won't allow it to travel more than a couple of inches (maybe less depending on the springs' condition) before it makes unwanted contact with the frame. CPP's Rear Leaf Spring Conversion Kit lowers your truck's rear and gives it plenty of room for travel, and it's equipped with the necessary hardware to update your rearend to a later model unit with larger-diameter axle tubes. 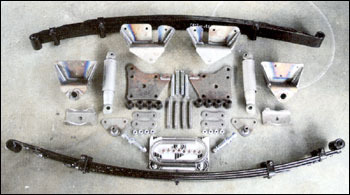 The kit features brand-new dropped leaf springs, a shock kit, brackets, shackles, hangers, U-bolts and mounting instructions. Since the front of this truck was previously upgraded to five-lug disc brakes, it was natural to convert the rear to a later-model rearend with the same GM 4-inch bolt circle. We used a GM 10-bolt rearend from a 1981 Pontiac Trans Am equipped with the desirable Posi-traction and disc brake options. Our rearend's width perfectly matched the original unit's, with 62 inches measured from wheel mounting surface to wheel mounting surface. Once the rearend was buttoned in place, the final touch was a fresh set of rolling stock from Wheel Vintiques and Coker Tire to match the front rollers. Get your own ride looking and riding better than ever with pieces from Classic Performance Products. CPP strongly recommends removing the truck bed because it makes it much easier and safer to complete the installation. This also made for a great opportunity to fully inspect the vehicle's rear and clean up the frame as necessary. Most everything in this picture will be discarded, except the perimeter frame. With the original rearend removed and out of the way, the old leaf springs and mounting brackets will be added to the scrap pile. 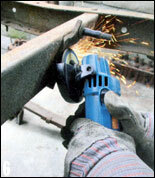 The easiest way to remove the leaf spring brackets is to grind away all the out- side facing heads of the rivets holding the bracket to the frame. After removing the rivet heads, we cut through the upper corners of the brackets and knocked them away with a small chisel. With the upper corners no longer holding the brackets to the frame, we used a large chisel to free the bracket entirely. 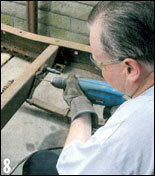 The remnants of the rivets were knocked through and free of the frame with a center punch. 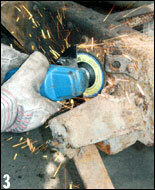 Removing the upper shock brackets required grinding off the rivet heads securing them to the crossmember. After grinding away the rivet head, we marked the rivet's flush side with a center punch. We ran a drill through the rivet to relieve its mechanical pressure. We can now push the rivet out the bracket and crossmember. The clean rear rails are now ready for the new parts. 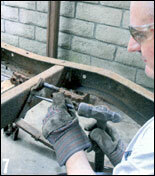 This is a very good time to restore the rear frame and clean away decades of road debris and rust. The new leaf spring brackefs are installed in the same manner as the old using the original upper two holes as a reference. Secure the bracket to the frame with the supplied hardware. With the bracket in place, drill the remaining holes in the bracket through the frame with a 3/8-inch drill bit and fully secure the new brackets to the frame with the supplied hardware. 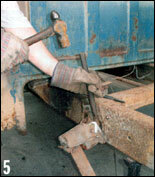 Repeat this process with all four brackets, including the rear shackle mounts. 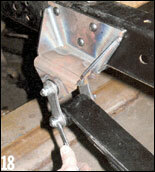 The new upper shock brackets mount outboard of the original upper bracket hole. 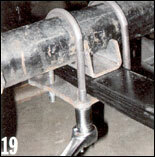 Measure over 3-1/2 inches and down 1-1/8 inches from the crossmember's upper edge. Mark this spot and dimple it with a center punch. 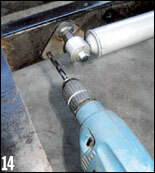 After drilling the marked spot with a 7/16-inch drill bit, mount the upper bracket and shock with the supplied hardware. With the bracket secure, drill the two remaining lower holes with a 3/8-inch drill bit and finish securing the bracket with the supplied hardware. After installing all the new mounting brackets, it is time to mount the leaf springs and hang the rearend. The new leaf springs bolt right into the new brackets with the heavy-duty supplied hardware. The new rearend can be rolled into place on a floor jack and the leaf springs lifted into place and secured to the rear shackle brackets. With the rearend resting loosely in the new axle pads, support the rearend's nose until it's firmly tightened in place. 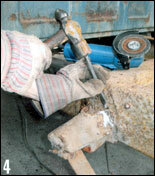 Tighten the shackle pins in the dog-bone brackets using the supplied nylox nuts. With the rearend centered correctly on the axle pads, secure the rearend to the leaf springs with the U-bolts and the five-hole lower mounting plates. At this point, check the pinion angle for three degrees up from ground level. 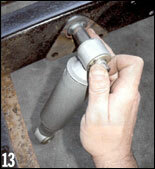 The shocks can now be mounted to the lower five-hole bracket that also doubles as a shock mount. With all the pieces in place and the rearend sitting on the wheels, the pinion angle can again be checked with a dial indicator. Optimally, all the vehicle's weight should be in place and the pinion angle checked one last time before welding the axle mounting pads to the rearend housing. The finished installation is ready for the new driveshaft to be measured. Then the bed can be returned to its rightful place atop the frame rails. Because we swapped from a six to a five-lug passenger-car bolt pattern, fresh rollers are definitely in order. We achieved a super-cool retro look with a pair of beautiful chrome-reversed wheels from Wheel Vintiques wrapped in a pair of U.S. Royal wide whites from Coker Tire. A timeless look never goes out of style! Not quite ready for its debut, the truck is moving along through its rebuild nicely thanks to easy-to-use products from Classic Performance Products.